With Xara 3D Maker at your fingertips you will be able to transform text and shapes into high-quality 3D graphic and animations. A range of designs and templates in different styles, plus intuitive realtime editing and easy-to-understand tools will quickly help you produce professional results. Design professional banners featuring your own custom text and position them on your website as easily as logos. Use custom-designed 3D effects and animations to show off your products. It's super easy to create buttons and use them in navigation bars or as menu options. 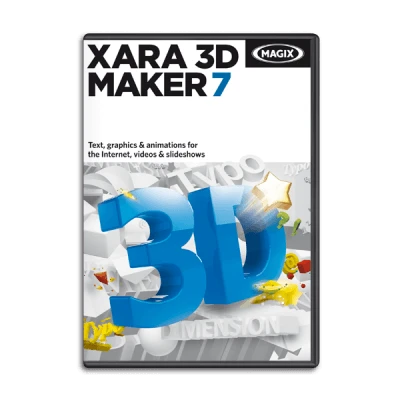 Xara 3D Maker is also perfect for use as a 3D title editor in combination with other video & slideshow programs. Create dynamic title animations, impressive intros & outros, lively decorative elements, as well as chapter and DVD menu titles. Alter the spatial depth and perspective of your 3D graphics easily and in realtime by simply dragging the edges using the mouse or by rotating the object freely on its axes.